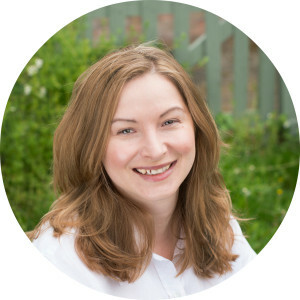 If you’ve been in business for a while, you know that sinking feeling – you appreciate social media, you understand the importance of having ‘them’, but once in a while it can just feel too much. 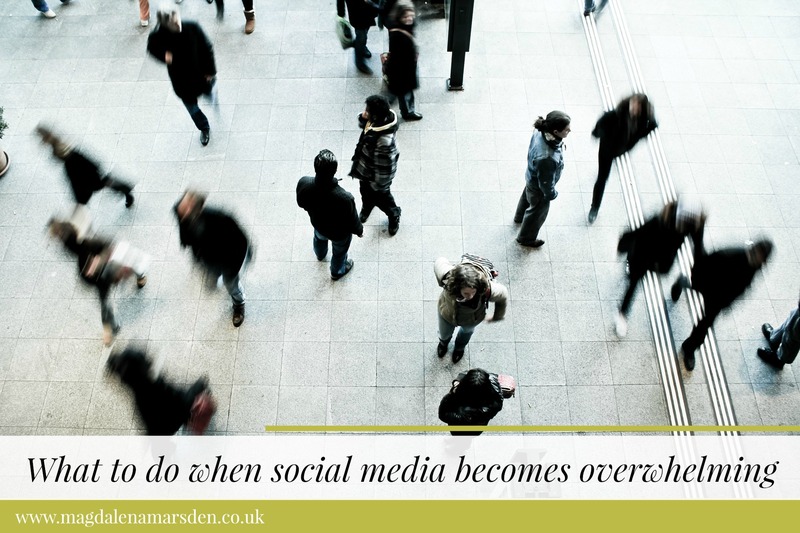 Social media can become very easily overwhelming and if you are not careful it will take up more and more of your time and energy. I think that most of us feel guilty about stopping or changing the way we use social media. Why? Because it’s free and because you ‘meant to be visible’ and because, well you know, it helps to market your business. But does it? First of all have a look at your ideal customer and identify what social media they use. Unless you do it for fun, there is hardly any point being on a social media platform that your customer ignores. If you are using social media to market your business, you need know how to measure your effectiveness. You should be tracking down how your customers find you. Is it actually through social media? If yes, which one? You could start by sending out a short survey to your customers (at the same time ask them what social media they use on a regular basis), adding a section to your checkout (How did you find us?). Note down when you know for sure you got an order or enquiry because your customer saw something you posted on social media. Another way of checking what works and what doesn’t is to check your website Google analytics under the tab of social referrals. You should be able to easily identify which social media platform brings you the most traffic. Obviously, volume is not everything, so check how long people stay on your website and what is their engagement (eg. what page they visit). For example, if your Facebook page brings the most traffic, but people don’t stay as long as smaller traffic volume from Twitter, it’s still worth focusing on both. Not everything can be scheduled and not everything should be scheduled, but it can save time, energy and help to cope with social media overwhelm. To start off, schedule social media for one week ahead and then check each social media platform once a day to respond to any messages. This way, you will feel more in control. If everything else fails and you still feel overwhelmed, just have a break! What’s the worst thing that can happen? People who really want something will e-mail you rather than message you, tweets and responses can be still answered a few days later, unwanted messages and posts can be deleted. The chances are that nothing drastic will happen if you take a few days off and you will come back refreshed and ready to dive in again. Still feeling a bit miffed about social media? 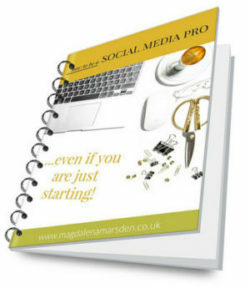 Why not download my free guide to social media, which includes social media tools and suggestions on how to tackle social media like a pro. And as ever I’d love to know how you cope with social media overwhelm and what works for you. Great tips and useful to remember not to get overwhelmed by the need to keep up with your social media. Automating posts has been a life saver for me! Great guidelines for avoiding social media overwhelm, Magdalena. Thank you – very helpful.